Comet C/2014 Q2 (Lovejoy) is currently making a close pass to the Pleiades and so should be particularly easy to find over the next few nights. I photographed it last night using a Canon EOS550D and 100mm, f/2 lens. It's an interesting coincidence that two bright comets with the designation Q2 passed by the Pleiades 10 years apart. 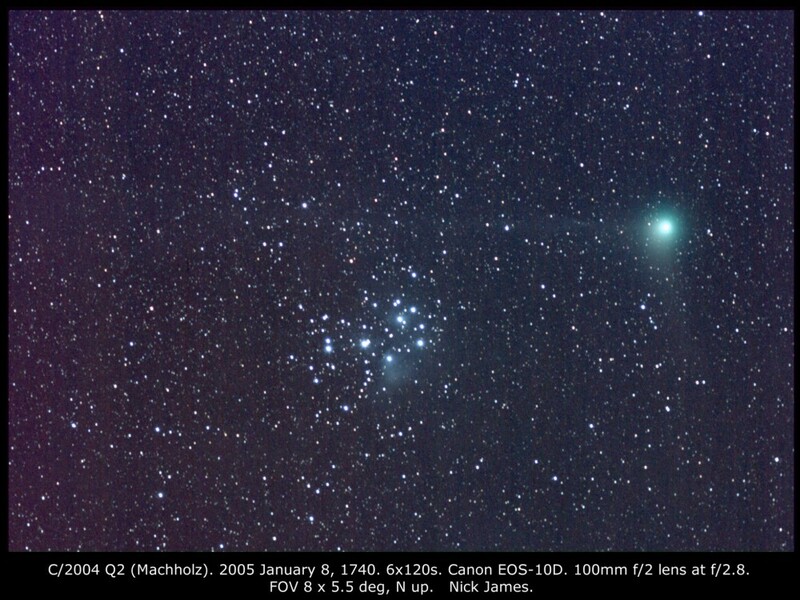 C/2004 Q2 (Machholz) was at its best in January 2005 and it made a close approach to the Pleiades on January 8th. It had ion and dust tails separated by over 90 deg in PA. My photo is here. C/2014 Q2 (Lovejoy) is now doing the same thing now but only has the faint ion tail. Both of these pictures were taken with the same lens but the 2004 one used a Canon EOS 10D. The 2014 one was with a Canon 550D.